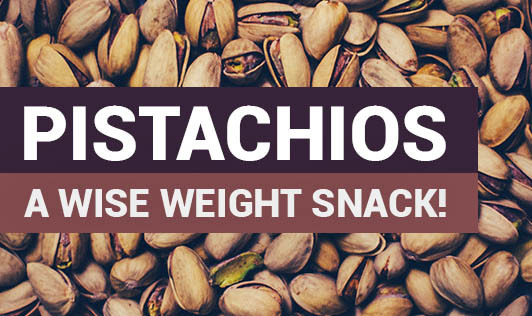 Pistachios- A Wise Weight Snack! Snacking is a natural part of the day, so what we snack on should be natural as well. And now that you all can guess on the snack? Yes, it is the pistachios that are referred to as a super snack, which are loaded with low calorie, proteins, vitamins, minerals, mono unsaturated fats and fiber. It is one amongst many snack nuts, to offer more nuts per serving. Interestingly, pistachios can be included in your daily diet as a healthy option. It is a heart healthy nut stacked with anti oxidants and fiber that help to reduce the bad cholesterol level and is also for those who are managing their weight. Scientists have discovered that people who ate in-shell pistachios consumed fewer calories than those who ate de-shelled pistachios. The latter sought to provide "visual cues" that reminded the consumers on how much they have been eating. Unlike sitting down with a bag of chips while you work or watch television and not knowing exactly how much you've consumed, the pistachio shell reminds you of how much you have eaten. So, enjoy 1 serving of this nut between the breakfast and lunch or between the lunch and dinner, as options to your regular ones to help derive its benefits. • There are many ways to enjoy eating pistachio nuts. The easiest way is to just pop out of the shell and eat as is! • Mix them in with cooked vegetables and fruit salads. • Add them to cold and hot cereals like cornflakes, oats, muesli, rice dishes and pastas. Weight watchers - Don't go too nuts... Enjoy it in moderation!